To ease Kunal’s pain, a doctor gave him a painkiller. An Indian army surgeon, Lt. Col. Prem Singh Bhandari, crawled into the work space that rescuers had dug around the boy. The doctor later described the space as “a cave about 2 feet by 2 1/2 feet.” Bhandari asked for a large knife, “and in one go,” the surgeon said, “I just cut the skin and all the soft tissues.” Bhandari’s only problem, he said, was cutting through the bone, since he didn’t have enough room to move his hands freely. The surgeon used a hammer and chisel to cut through about 70 percent of the bone and had rescuers pull the boy up. Then Bhandari used a carpenter’s saw to finish the job. Rescuers raced Kunal to a makeshift hospital set up by the Red Cross, as the quake had destroyed most local hospitals. Kunal is thankful to be alive. “I thought of God only. I kept my faith in God,” said Kunal, while recovering in the hospital. Although there were several miraculous rescues like Kunal’s, the quake claimed a staggering number of lives. The quake’s official death toll, as of February 1, was 14,240, but many people fear the number will climb much higher by the time all the rubble and debris is cleared. At least 61,638 people were reported injured. The quake, which according to the U.S. Geological Survey measured 7.7 in magnitude, was felt throughout much of Pakistan and as far away as Nepal and Bangladesh. Magnitude indicates the overall power released in an earthquake. Each number on a magnitude scale indicates a power ten times stronger than the preceding number. Scientists consider earthquakes above magnitude 7.0 to be major earthquakes, capable of widespread damage. Those who survived the quake face many hardships. “It is devastating,” said Martin Kelsey, director of India’s Save the Children. “It’s as if villages had been hit by an atomic bomb. Village after village has been razed to the ground.” In Bhuj, a city near the quake’s epicenter, or focus, Kelsey said mountains of rubble stretch as far as the eye can see. For weeks after the quake, the stench of rotting bodies filled the air. Funeral pyres, on which Hindus cremate the dead, burned night and day. The Federation of Indian Chambers of Commerce and Industry estimates the financial damage of the quake at $5.5 billion dollars. It will take months, even years, for western India to rebuild. Aid poured quickly into India from around the world. More than 20 countries, including the United States, and dozens of international aid groups, such as the International Red Cross and World Relief, delivered food, blankets, and emergency supplies. Even neighboring Pakistan, which has fought three wars with India since 1947, sent relief planes loaded with blankets, tents, and food. “The desperate situation transcends political differences,” said Pakistani Foreign Minister Abdul Sattar. India is no stranger to earthquakes, as it lies near the region where the greatest continental collision on Earth takes place. The Earth’s surface is divided into about seven major moving tectonic plates. About 60 million years ago, the Indo Australian plate collided with the Eurasian plate–and neither plate yielded. The interface between the two plates formed the Himalayas, the greatest mountain range in the world. The impact between the two plates continues to this day and, as a result, the Himalayas are still rising. Satellite measurements put their growth at about 5 millimeters per year. Great earthquakes, with a magnitude of 8 or higher, occur about once a year, and completely destroy communities near the epicenter. Major earthquakes, with a magnitude from 7.0 to 7.9, occur about 18 times per year, and inflict widespread, heavy damage near their epicenters. Strong earthquakes, which occur about 120 times per year, have a magnitude between 6.0 and 6.9. They are capable of serious damage if their epicenters are near heavily populated areas. Moderate quakes have a magnitude between 5.0 to 5.9 and occur about 800 times per year. Damage is negligible in buildings of good design and construction. Light quakes, with a magnitude between 4.0 and 4.9, occur about 6,200 times per year. Damage is minimal, but shocks and rumblings can be felt by all near a light quake’s focus. Minor quakes occur about 49,000 times a year and have a magnitude between 3.0 to 3.9. 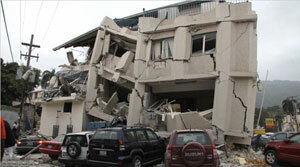 Their damage is slight, but minor quakes can be felt by nearly everyone near their epicenters. Very minor quakes, with a magnitude between 1.0 and 3.0 occur about 9,000 per day. They are generally not felt, but can be detected by a seismograph. * April 23, 1999: More than 110 people are killed in a 6.8 magnitude quake in Chamoli in the Himalayas in India’s Utter Pradesh state. * May 22, 1997: An earthquake kills 43 and injures 1,000 in Jabalpur in Madhya Pradesh state in central India. * Sept. 30, 1993: As many as 10,000 are killed and thousands more are injured after a 6.0 quake strikes Latur in India’s Maharashta state. * Oct. 19, 1991: About 2,000 are killed after a 7.0 quake strikes northern India. * Aug. 20, 1998: A magnitude 6.6 quake strikes the state of Bihar, killing more than 1,450. * Aug. 15, 1950: A magnitude 8.5 quake killed about 1,538 people in the state of Assam, in northeastern India. CONSIDER THIS … What if a major earthquake struck your town? Write a short description about how it might affect your life. Red Cross. The Red Cross is an organization dedicated to relieving human suffering around the world. More than 135 nations have Red Cross societies. Each society is run by local leaders, but all Red Cross organizations are united in their goals to help people in need. Red Cross services are staffed by volunteers and a few career staff members. The Red Cross began after Henry Dunant, a Swiss banker, encountered the Battle of Solferino during the Austro-Sardinian War (1859). Dunant was traveling on business when he came upon a battlefield the day after 40,000 people had been killed or wounded. Dunant organized a group of volunteers to help relieve the suffering of the wounded. Afterward, he began to write pamphlets calling for a a permanent group of volunteers who could help others in times of war. In 1863, a group of delegates at a conference accepted Dunant’s idea and formed a relief organization. They adopted the red cross as their symbol, in honor of Dunant’s home country of Switzerland (the Swiss flag is a white cross on a red background). Earthquake hits anywhere in the world. Your greatest sword to battle it is knowledge. You have to know what to do when it happens. Your entire family has to be aware of it. Some of the most important things you have to bear in mind when there is quake is to have presence of mind. Be alert and do not let fear take on you. I was told that one has to be into a fetal position when getting inside a cover. This position is the best way to keep yourself small and safer from falling debris. I have read somewhere that the best way to be safe when quake strikes is not to try to go outside your home. You have to find the nearest cover and stay there until the earthquake stops.